1) Hybrid polymer walls will not kink under pressure – The unique wall design is made from materials that have no memory. Therefore, the hose will uncoil with you as you tug and pull it throughout your garden. It will coil back up just as easy! 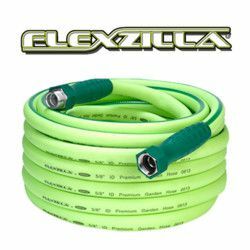 Besides the material, the Flexzilla has a kink-resistant fiber that runs through the length of the hose that prevents the it from kinking when under pressure. 2) Lightweight design – 100 feet only weighs about 15 pounds, which is about 25% lighter than rubber garden hoses. 3) Aircraft aluminum threaded ends – Aluminum reduces the overall weight of this garden hose while also providing incredible toughness. The aluminum ends are stronger than typical brass fittings and help prevent them from being stripped, worn down, or damaged. 4) Swivelgrip connectors – New for 2015 is the Swivelgrip model, which is the one that we are stocking. It offers all of the same features as the original Flexzilla garden hose, but it also incorporates ends that are easy to grip and easy to twist with your hands to attach and disconnect from the spigot, hose nozzles, or sprinklers. This is a truly unique feature that we have not seen on any other garden hose before! The demonstration video below shows the Swivelgrips in action! 5) Drinking water safe – the polymer walls and aluminum ends are all made to be drinking water safe, which makes this hose great for marine use, kids play pools, and much more!